Released by Arturo Fuente in 2013, Casa Cuba premium cigars are blended entirely at the Fuente’s Tabacalera A. Fuente y Cia factory in the Dominican Republic, by the family patriarch, Carlos Fuente Sr. Each of these hand-rolled cigars are infused with binders and fillers from Cuban-seed Dominican tobaccos and wrapped up tightly inside a perfectly aged reddish-brown Ecuadorian Havana wrapper. 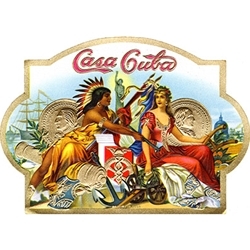 The Casa Cuba by Arturo Fuente cigars have a strength level that is medium-bodied offering flavors of earthly wood tones with hints of spice sprinkled throughout the profile. Another great Dominican handmade cigar line that pays homage to classic cigars, produced exclusively by Arturo Fuente. Smokers Discounts offers the perfect way to unwind with Casa Cuba by Arturo Fuente premium cigars. Every cigar purchased on our online cigar store can be delivered right to your front doorstep. We’ve made it easy and affordable to buy hand-rolled cigars. A variety of sizes and flavors are listed below, each of these styles are in stock and available for a low discount price! Call us for more details!